- Publisher Orthodox writers--Justin, Ireneaus, Hippolytus, Eusebius, Epiphanius, and others--wrote about the persons and movements they considered heretical. In this book the editors have gleaned excerpts from these and other writers concerning heretical figures and movements of the first two centuries, including Gnostics, Marcion, Montanus, Ebionites, Adoptionists, and others, plus excerpts on the origins of Gnosticism. 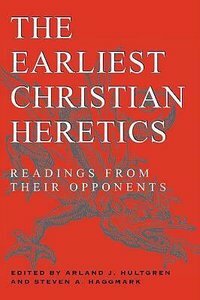 About "The Earliest Christian Heretics"
Orthodox writers--Justin, Ireneaus, Hippolytus, Eusebius, Epiphanius, and others--wrote about the persons and movements they considered heretical. In this book the editors have gleaned excerpts from these and other writers concerning heretical figures and movements of the first two centuries, including Gnostics, Marcion, Montanus, Ebionites, Adoptionists, and others, plus excerpts on the origins of Gnosticism.